I recently upgraded my home machine to Vista and found that when I viewed photos in Windows Photo Gallery or Adobe Photoshop the tint was off. For me it was very pink. It is apparently a common issue to have the wrong tint in these applications even if the photos look fine in thumbnail or through your web browser. Open up Color Management from the Start Menu “start search” box. 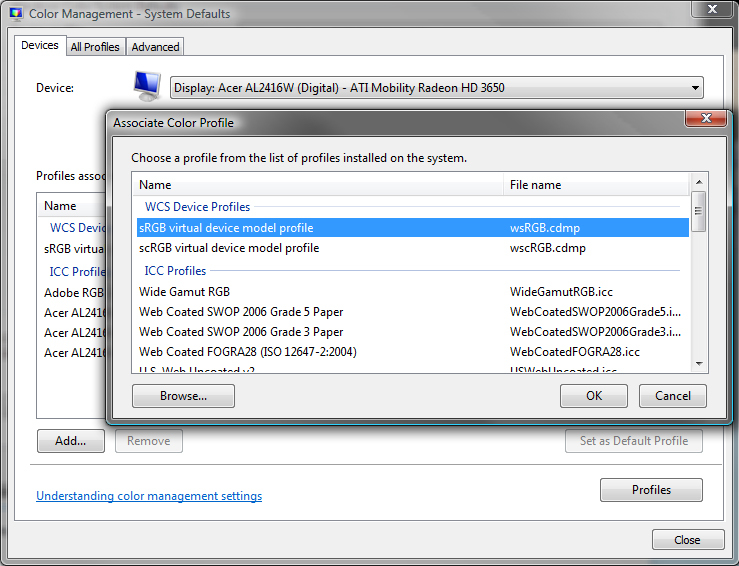 If you have the drivers installed for your monitor, it may have a .icm file or two listed. But you don’t have to use those, you can use the default windows one which tends to work pretty well. Then on the bottom click on the Change System Defaults button. A new window will open that will allow you to make changes to the Color Management. Click back to the Devices tab and click the Add… button at the bottom left. 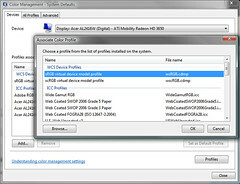 Then select the appropriate ICC Profile or WCS Device Profile the click OK.
That will close the window and now you can select the new profile and click Set as Default Profile as highlighted in blue below. Oh and one last thing, make sure to Reboot or you won’t see the change. And they say computers aren’t easy. 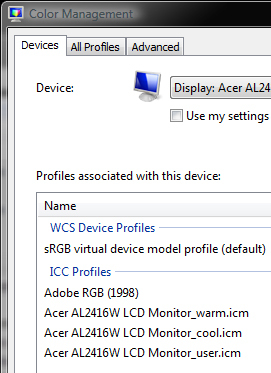 Categories: Technology and Toys | Tags: color management, ICC Profile, microsoft, vista, WCS Device Profile | Permalink.